This is Gayatri today. I am excited to bring you a regular technique based feature at Winnie & Walter Blog. I will be focusing on one technique per month showcasing two different styles of execution. There will be two posts one per fortnight focusing on each style of execution with photos as well. I am excited to bring you this feature. Hope you are too. To start the feature, the technique this month is Inlaid Die Cuts. As you know Winnie & Walter has some fabulous new dies released this May. I am using In A Word: Hugs Cutaway today for my inlaid die cut card. The style will focus on in-laid die cut as the focal point. I masked the white cardstock to expose the bottom one third. I then sponged and blend Salty Ocean, Shabby Shutters and Crushed Olive distress inks. Then use the Hugs die to die cut with the die placed half on the sponged area and half on the white area. I also die cut four more using white cardstock. I stacked and glued them all down with the coloured die cut on the top of the stack. The die cut negative panel is adhered on the card front. 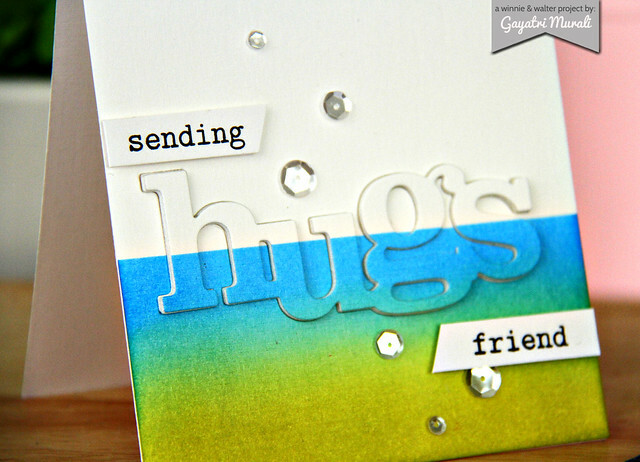 The stacked Hugs die cut is laid back into the negative and glued. Also glue in the smaller bits inside as well. Finally, I have used smaller sentiment from The Big, the Bold and Friends stamp set to complete the sentiment. And embellished with Pretty Pink Posh’s Sparkly Clear Sequins. The focus here is the Hugs die cut which is inlaid back into the negative with a bit of dimension. Here are some closeup photos of the card. If you like to play along, we have a linky attached with this post. Love to see what you do with this technique and keeping it as a focal point. In a fortnight, I will share another post using the same technique but in a different style of execution. Gorgeous! I think I need to break in my new Big Shot Plus with this die. I love the colors you used on this card. So pretty, love the colors!! Congrats again on your new special feature! I love this card, and that technique is always great! Congrats on your first post in this regular feature! Great tutorial, Gayatri! Congrats on your new feature. I look forward to learning more from you each month. Love learning new techniques so I'm really happy to see this feature! Love your card, Gayatri! Love the step by step photos Gayatri - I don't always have access to video. Looking forward to future tutorials! 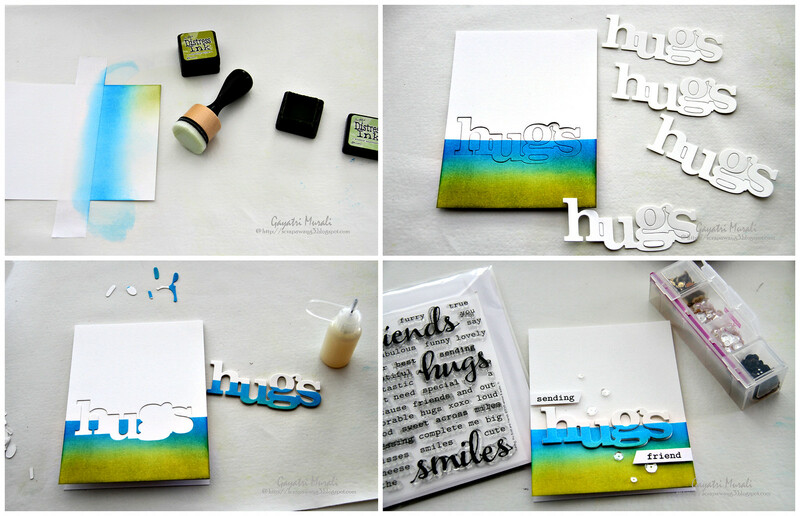 Beautiful card and great tutorial...thanks Gayatri! This is beautiful. I haven't tried this yet - have to find some time soon! Yes awesome I love that inlaid technique have used it several times now. Thank you very much for your clear tutorial and love this new feature. Great technique, thank you so much for sharing! I'll give it a try for sure! I've really enjoyed this first InFocus post, Gayatri, and look forward to more! this is gorgeous!! love this technique.. Your first feature: fabulous! Looking forward to more! I need all the technique-inspiration I can get, and you've sure sparked some ideas with this debut card and tutorial! Thank you! What a fabulous technique ...Thank you so much for sharing ..Your card looks awesome ! !